Candy, Chicks, and Rock 'n' Roll. $37.543 million on 3579 screens. Pity the poor Easter Bunny. If you take a look at this site’s holiday page, you’ll find about 10 feature films in which Santa Claus is either the star or an important player. Such attention doesn’t land upon the Easter Bunny – if he fills a signficant role in any of those big-screen efforts, I missed it. With 2011’s Hop, we get an attempt to correct this situation. We meet a young rabbit named EB (voiced by Django Marsh), the son of the current Easter Bunny (Hugh Laurie). EB learns that he’ll someday grow to replace his dad, but he doesn’t seem eager to accept that responsibility. The film leaps ahead 20 years to show Fred O’Hare (James Marsden), an underachieving man who still lives at home despite his advancing age. (We’d encountered him as a kid who actually saw the Easter Bunny at work.) His parents (Gary Cole and Elizabeth Perkins) tire of his refusal to leave the nest and give him a big old shove. In the meantime, an adult EB (Russell Brand) gets pushed to take over as the Easter Bunny. However, EB resists his supposed destiny; instead, EB would prefer to follow his musical muse and become a rock drummer. His dad refuses to accept this, so EB runs away from home and scampers to Los Angeles, where he plans to achieve his dream. There he bumps paths – literally – with Fred and both their lives change, as the wheels eventually get so in motion to make Fred the first human Easter Bunny. 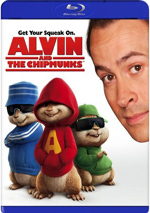 I’d be tempted to make a snarky comment like “I liked Hop better the first time when it was called Alvin and the Chipmunks”, but that’s not true – I didn’t much care for that flick. However, the pair show a lot of similarities, both in terms of technical elements and story-related components – so many commonalities that it’s tough to think Hop would exist without the successful precedent set by Alvin. Both really do offer stories follow similar paths. In Chipmunks, we get musical furry mammals who initially annoy but eventually help an underachieving human, and that’s what we find here as well; essentially if you take just Alvin and lose Theodore and Simon, you’ll have EB. Obviously the Easter Bunny theme creates a change-up from Chipmunks, but Hop still feels like its awfully close in tale and tone. Of course, the pair share obvious technical connections as well. Unlike the days of Who Framed Roger Rabbit and earlier, computer animation has made the integration of live action and cartoon characters much easier, so we’re seeing plenty of films in that vein. 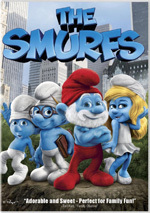 Chipmunks didn’t pioneer that push, but it made more films like this and Smurfs enter the marketplace. Also like the first Chipmunks, Hop creates a mildly engaging piece of entertainment – but only mildly. From start to finish, the film remains watchable, but I can’t say anything more for it. While it occasionally gets a little edgy – or at least “edgy” for “PG”-rated family material – it never threatens to do anything especially inventive or creative. Which gives it a “been there, done that” factor. Although the Easter-related concepts boast some potential for originality, they don’t do much to head down that path. We’ve seen so many flicks that go “behind the scenes” of the North Pole that the change in holiday/scenery doesn’t do a lot to develop anything especially fresh. I will say that the film’s climax lifts it up a bit. I won’t get into it too much – a discussion might enter “spoiler” territory – but I will say there’s an attempted Easter-related coup that brings some fun and originality to the movie. But once again, it’s just a bit. Much of the time, Hop seems to operate on cruise control. While it never turns into unenjoyable family entertainment, it also never threatens to become anything memorable or dynamic. Hop delivers watchable holiday comedy and nothing more. Footnote: make sure to stick around until the conclusion of the end credits for a little surprise. Hop appears in an aspect ratio of approximately 1.85:1 on this Blu-ray Disc. While not the greatest transfer I’ve seen, the image appeared solid. Colors became a highlight. As one might expect from an Easter-centric film, this one boasted a broad, dynamic palette. A wide variety of other tones appeared, and all of them looked rich and lively. Blacks were dark and deep, and I thought shadows seemed smooth and clear. I felt consistently pleased with the transfer. Though also not killer, the film’s DTS-HD MA 5.1 soundtrack worked fine. Much of the movie demonstrated good range and activity. The forward channels did the most damage, as they showed nice movement and integration. The surrounds offered a reasonably solid level of involvement as well; this wasn’t an action spectacular, but it contributed an engaging sense of place and movement. Audio quality was positive. Speech was consistently natural and concise, without edginess or other issues. Music appeared bubbly and bright, while effects showed good power. Those elements offered positive accuracy and heft throughout the movie. Nothing here dazzled, but the track suited the film. When we shift to extras, we open with a staple of Universal Blu-rays: the interactive U-Control feature. Often that provides picture-in-picture footage/interviews, but here it splits into two fluffier domains. “Hop Tweets” delivers quick text comments from EB, and with “Pink Beret Tracker”, an image occasionally appears on screen to show different elements. We see a GPS depiction of EB’s current location, storyboards, and information about the movie’s songs. Neither of these “U-Control” components add a lot to the package,but both are decent. Called Phil’s Dance Party, a new “mini-movie” runs three minutes, 14 seconds. It shows the film’s leading chick characters Phil and Carlos as they perform dances and banter. Don’t expect much from this barebones short, as it doesn’t even bother with a virtual set; the chicks dance in front of a white background. Hank Azaria also fails to come back as the voices, so we get substitute actors. It lacks much merriment and seems cheap given that the Blu-ray’s case heavily touts the presence of the “all-new mini-movie”. We find a run of featurettes next. Under The World of Hop, we get six clips: “A Look at the Candy Factory” (1:34), “A Look at EB” (2:02), “A Look at Fred” (1:19), “A Look at the Easter Bunny” (1:10), “A Look at Carlos and Phil” (1:45) and “A Look at Sam” (1:17). Across these, we hear from co-writers Ken Daurio, Cinco Paul and Brian Lynch, director Tim Hill, animation supervisor Chris Bailey, producer Chris Meledandri, and actors Russell Brand, James Marsden, Elizabeth Perkins, Hugh Laurie, Hank Azaria, and Kaley Cuoco. These examine sets and visual design, cast, characters, and performances. We see some good footage with the actors at work – I especially like the shots of Azaria as he argues with himself – but the information seems fluffy and does little more than tell us of the actors’ greatness. Via All Access with Cody Simpson, we locate a two-minute, 28-second look at the young singer. We see a little of him in the studio but mostly see him at the premiere and hear him tell us how incredible and wonderful everything is. You can safely skip this nonsense. Russell Brand: Being the Bunny lasts one minute, seven seconds as it offers comments from the actor. We view Terry Gilliam-esque animation as Brand tells us the “research” he did for his role. This becomes a frivolous but moderately amusing extra. We see more from the actor with the two-minute, 57-second Russell Brand’s Kid Crack Up. In this, Brand does the Art Linkletter thing and chats with little kids about the movie; Cuoco also shows up briefly. He’s more irreverent than Linkletter and that adds a little fun, though the best bit comes at the end when he tosses a barb at Cuoco. Carlos on Carlos: The Premiere According to Carlos fills three minutes, 30 seconds. It lets us see footage from the premiere while Carlos the chick talks with various participants and touts his greatness. We find a little comedy, though the continued use of a substitute actor disappoints; things like this work better with the original performer, as that person’s absence makes the product seem more low rent. The Carlos-centric credits are the best part. For another wacky piece, we go to Emotion in Motion: The Dance of Ken Daurio. It lasts two minutes, 34 seconds and focuses on screenwriter Daurio. Here he pretends to be a choreographer and shows us his so-called moves. All very tongue in cheek, it creates modest amusement. With Post Coup Commentary: Carlos and Phil Tell All, we find an animated clip. It goes for two minutes, 59 seconds and gives us another piece ala the earlier Carlos offerings. Like those, it’s mildly enjoyable but no better, and it still loses points due to Azaria’s absence. Under Games, we locate three options: “Drum Along”, “Pink Beret Skill Tester” and “EB’s Candy Challenge”. “Drum” offers a basic memory contest; the interface is so slow and clunky that any potential fun goes down the drain. “Tester” throws out three mini-games; some are better than others, but none seem great, and I continued to encounter some glitches. Finally, “Candy” concludes with a board game that comes with more “mini-games”. Most of the time, I just pressed a virtual spinner and watched my token advance; I had to play one mini-game at the end but that was it. Yawn. The disc opens with ads for Curious George, Barbie in A Mermaid’s Tale, and Bring It On: The Musical. No trailer for Hop shows up here. On a second platter, we get a DVD copy of Hop. This offers a standard retail release, so expect a good complement of bonus materials. 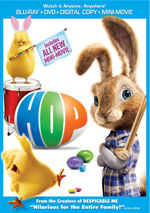 While I like the idea of an Easter Bunny-focused feature film, Hop does little to encourage future efforts in the genre. Here we find a flick that’s relentlessly… okay. It boasts an acceptable level of fun but just can’t leap to a higher level. The Blu-ray delivers excellent visuals, good audio and an average set of supplements. 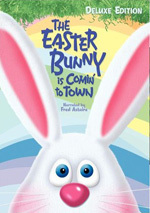 I suspect this one will get plenty of Easter play due to a dearth of alternate options, but it’s not a memorable movie.